This is the seventh of nineteen articles that are looking at the meta-results for both team and players, as collected from ELO-Following Football’s wide range of sources. 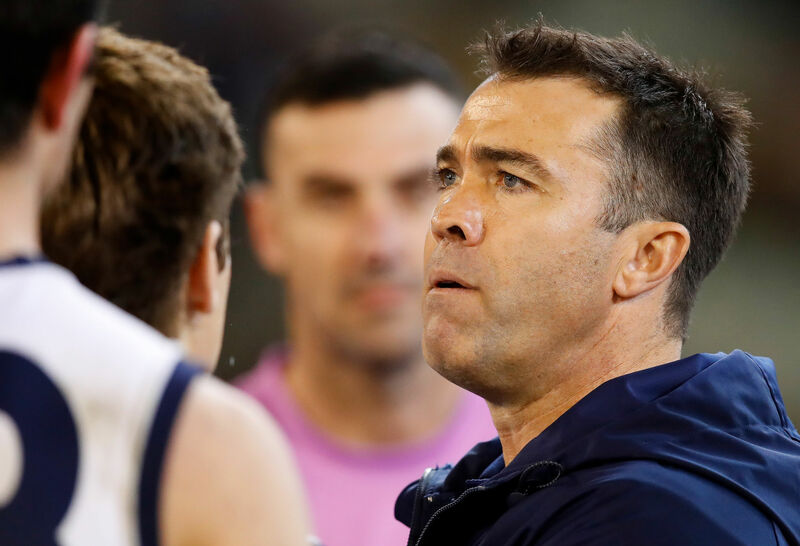 The team finished second with a home-and-away record of 15-6-1 with a percentage of 117, just lower than the Adelaide Crows, who took the minor premiership with the same record. Were sky high – the Little Master was home! 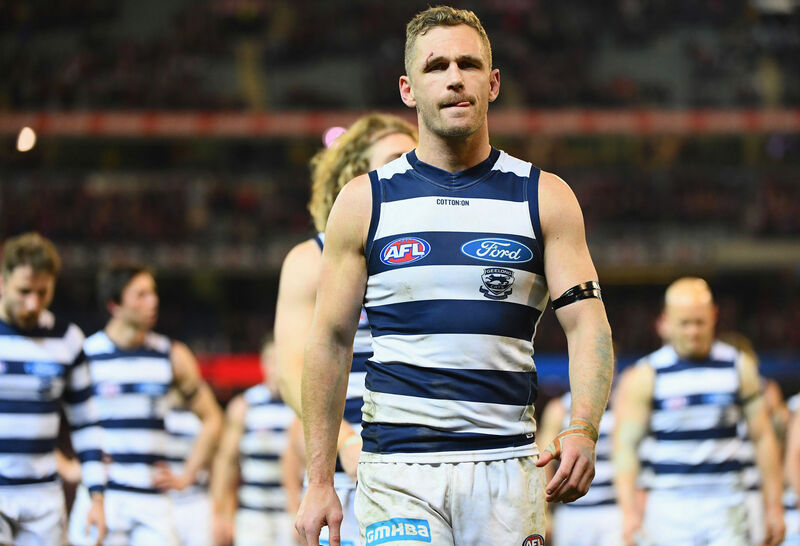 Scepticism about the rest of the list, plus optimism regarding other clubs, meant the Cats were pegged for an average placement of fifth, albeit a close fifth behind Richmond in fourth and Sydney in third. We at Following Football were the only ones who didn’t think they’d make finals, but there was everything between first and tenth in the predictions. 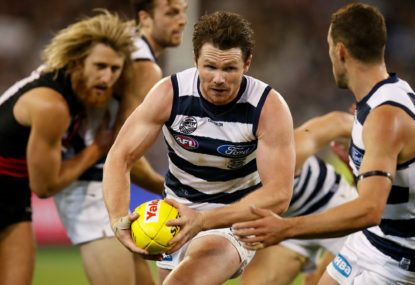 Coming into the season, the players who were considered to be in the top 50 in the league by the AFLPA or The Roar included the three obvious candidates: Paddy Dangerfield (top five), Gary Ablett Jr and Joel Selwood (top ten), plus Mitch Duncan. With a strong enough percentage (thanks to their easy last couple of games) that they didn’t sweat making finals during their Round 23 game versus Gold Coast. 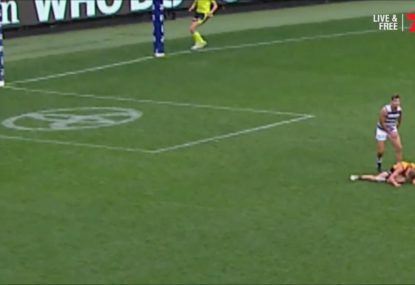 But they were the last ones in, finishing in eighth place, 13-9, with a percentage of 132, and then a quick exit at the hands of the newcomers to finals, the Melbourne Demons. Geelong won three premierships in the time Melbourne was absent from the finals. Hard to feel positive about that finish when the season started with so much promise! 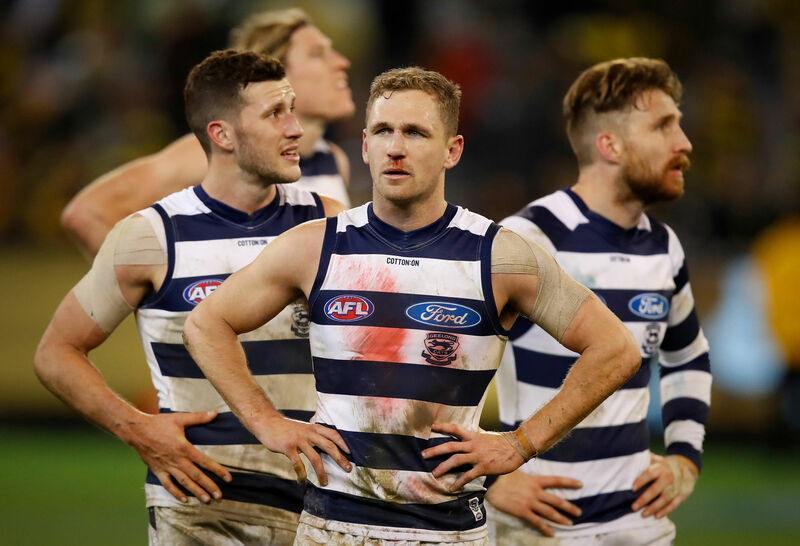 Three years since the Cats finished this low – they failed to make finals in 2015, ending in 10th place, a game and percentage out of the top eight. Before that, they’d made finals eight straight years, from 2007-14, including three premierships and six top two seeds. In fact, starting in 2004, the Cats have made finals 13 of 15 times, with 10th places interspersed in 2006 and 2015. This year’s eighth-place finish is their third-worst in that fifteen-year span. Melbourne and Brisbane fans won’t sympathise, but that’s why Geelong faithful are so troubled right now. According to our patented “ELO-Following Football” rating system, the team started the season at 61.0, which was the fifth-best rating in the league: Richmond had the highest rating at 77.8, followed by Sydney, Adelaide, and Port. 50 is average, and the lowest rating at the time was Gold Coast at 17.6. 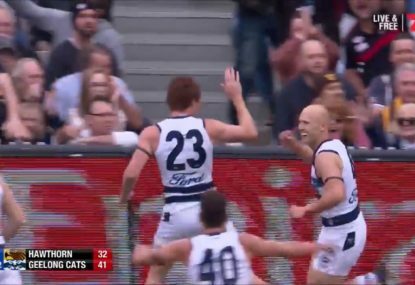 Throughout the season, the Cats never fell below 59, occasionally hitting the seventies; in Round 7, after their 93-32 rout of GWS, and momentarily after Round 12’s win over North. The two gargantuan wins over bottom-feeders in Rounds 22 and 23 boosted their already third-place rating through the ceiling, hitting 80.4 as they entered finals. Their loss to Melbourne dropped it to 76.9, which is still the best number in the league. Melbourne and Richmond were each higher entering the preliminary finals but, well, they weren’t nearly as high afterwards. As of today, unbelievably, they have the highest rating in the AFL. The other rating systems aren’t as bullish on the Cats: most still have Richmond at the top of their lists. Wooden Finger and FMI both have Geelong second, although The Arc and US Footy both dropped Geelong farther down; US Footy has them finishing all the way down in eighth, in fact. Betting Line expectations: 16-4, with two even games, with Melbourne in Round 1 and Adelaide in Round 17. They split those games. AFL.com.au game predictions: 17-5. The league’s forecasters believed in the look of the Cats. The Roar predictions: 16-5-1, with a for/against total vote of 89-32. We did, too. The Age forecasters: 15-7, with a breakdown of 165-99. BetEasy “CrowdBet” percentages: The “crowd” believed in the Trinity as well, voting 17-5 in Geelong’s favour. My own game-by-game predictions pegged them at 13-9, but then I thought they’d fail to make finals this year, so that was probably colouring my guesses. 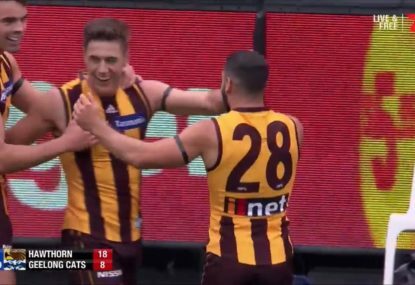 Round 18’s after-the-siren victory over the Demons, Zach Tuohy’s goal capping a 29-point comeback in the fourth quarter, is probably the leading candidate when it comes to drama. In terms of historical achievements, the 23-consecutive goal onslaught over the last three quarters against Fremantle in Round 22 was the highlight of a two-game glorified practice session against Freo and the Suns where the Cats outscored their opponents by the absurd score of 300 to 65, leading into finals. Presumably, the very next game, where an equally-hot Melbourne team defeated them in the elimination final, 75-46. Would Geelong have beaten Sydney, GWS, or even Hawthorn, if they’d faced them instead? Quite possibly. But that’s not how it works. Best & Fairest finish: Equal second. Received 17 Brownlow votes, most on the club and tenth most overall. Last year’s result: First on the club each of the past three years: second overall last year, and the AFL Meta-Player Of The Year in 2016.
Notable games: Four dominant games (R2, R17, R21 and R23), four prominent games (R5, R10, R15, and R19), and two notable games (R18 and R20). All-Australian half-forward; ELO-FF top 22, First team small forward. Best & Fairest finish: Fourth. Received nine Brownlow votes, fifth most on the club. Last year’s result: Seventh in 2017 (116th overall); ninth in 2016.
Notable games: Three dominant games (his incredible stretch in R18-19, plus R22), one prominent game (R7), and two notable games (in R12 and R23). All-Australian 40-man roster; ELO-FF top 22, First team full forward. Best &a Fairest finish: Sixth. 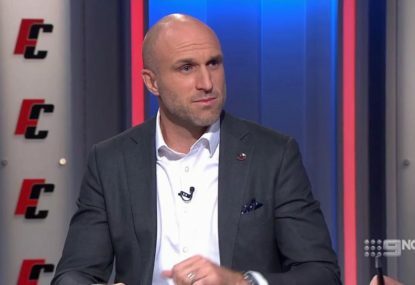 Received 14 Brownlow votes this year, equal second on the club. Has now received 248 Brownlow votes over his career, the most all-time. Last year’s result: First for Gold Coast (22nd overall), second in 2016.
Notable games: Two dominant games (back to back in R11 and R12), three prominent games (in R1 – welcome back! – R19 and R21), and three notable games (R2, and then in R22 and 23 to finish the season). ELO-FF top 22; ELO-FF First-team I/C M/F. Best & Fairest finish: Fifth. Received 14 Brownlow votes this season, equal second most on the club. Last year’s result: Second in both 2017 (11th overall) and 2016 (15th overall). Best & Fairest finish: Equal second. Received 13 Brownlow votes, fourth most on the team. Notable games: One dominant game (R22, that Freo eruption), three prominent games (R7, R11, and R20), and two notable games (R8 and R23). Notable games: Two prominent games, in R8 and R10, and one notable game over in R18. Best & Fairest finish: Ninth. Received seven Brownlow votes this season, sixth most on the club. Last year’s result: Third (33rd overall). Notable games: One dominant game (R16), and one prominent game (in R11). Best & Fairest finish: First; his second medal as Geelong’s Best & Fairest. Notable games: One dominant game, in R4, and one notable game, in R22. Geelong had eight top 100 players and 12 top 200 players in the 2018 ELO-FF meta-rankings. Jack Henry – 14th place (53 points) – One prominent game (in R7); voted Best Young Player. George Horlin-Smith – 24th place (15 points) – One prominent game (in R5); voted Best Clubman. Harry Taylor – 21st place (17 points) – First on the club during finals. Zach Tuohy – 11th place (75 points) – 10th place in Best & Fairest voting; third on the club during finals. In: Luke Dalhaus, Nathan Krueger, Gary Rohan. Gone: George Horlin-Smith, Lincoln McCarthy, Jackson Thurlow. Current list of draft picks: 12, 50, 59, 60, 70, 87. Backs: Jed Bews, Mark Blicavs, Lachie Henderson, Jack Henry, Jake Kolodjashnij, Tom Stewart, Harry Taylor, Zach Tuohy. Midfielders: Nakia Cockatoo, Charlie Constable, Jordan Cunico, Patrick Dangerfield, Mitch Duncan, Cam Guthrie, Tim Kelly, Joel Selwood, Scott Selwood. 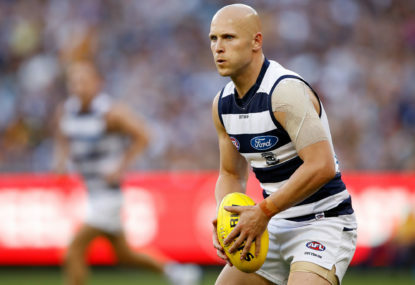 Forwards: Gary Ablett Jr, Wylie Buzza, Luke Dalhaus, Lachie Fogerty, Tom Hawkins, Jamaine Jones, Sam Menegola, Daniel Menzel, Quinton Narkle, Brandan Parfitt, Esava Ratugolea, Gary Rohan. What provides substantial hope of improvement over the one-and-out performance shown in September? Luke Dalhaus? He’s a fine player, but is he really going to take the pressure off Tomahawk? Gary Rohan’s one of my favourite players, but he seems even less likely to provide that. 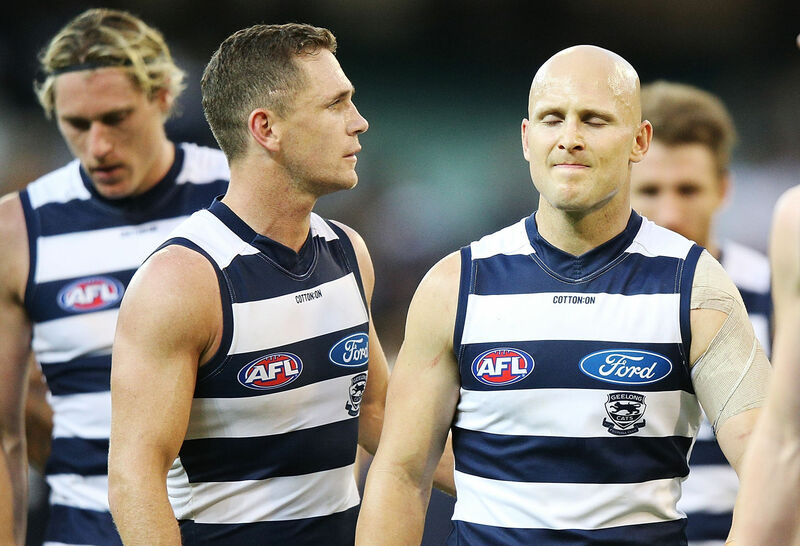 Meanwhile, Ablett and Selwood get another year older; Tim Kelly seems less than pleased to be west of the city, and momentum is not on their side. We have them landing in 13th place next season, at the bottom of a tight pack with the Kangas, Giants, and Dockers.